2018 has proven to be an interesting year so far, with bands like Funeral Mist and Dimmu Borgir returning from the void and releasing albums many thought would never materialize. 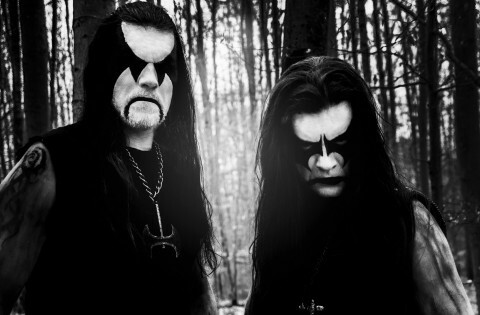 Immortal have re-appeared on the scene some 9 years since their last outing and most notably having shed their most prominent and infamous member, Abbath. Predictably the Internet black metal warriors were up in arms at the prospect of Immortal continuing after their divorce from Abbath, he's the black metal equivalent of Lemmy; his persona being a huge influence on the popularity of Immortal. The interviews he has appeared in, the evil-panda Kiss inspired corpse-paint and hilarious promo photos have essentially created a black metal stereotype — for so many that are exposed to the world of black metal (outside of bands like Dimmu Borgir) Abbath's face is one of the first that they see and the image that Immortal portrayed led by him for such a long time has had an undeniable influence (for better or for worse) on what metalheads think of when they imagine a black metal artist. Unsurprisingly, as soon as the first promo tracks were released much of the furor died down, many fans seemingly forgetting that Demonaz has always had majority influence on songwriting and the music that Immortal created. Having read some of his recent interviews this seems to be a point that he is very eager to reiterate, I can't help but feel there as some revisionist history happening from his point of view, as I remember some 15+ years ago it is reported that, whilst he still wrote some of the riffs, his medical affliction prevented him from playing them in the way they were meant to be performed. Regardless of the veracity of Demonaz's claims about always writing all of the music, what becomes apparent on "Northern Chaos Gods" is that even if Demonaz did write all of the music for every Immortal album, Abbath certainly had a large influence on shaping the riffs and how the end product materialised — something that is apparent from the time when Abbath took over guitar duties. "At the Heart of Winter" feels like an album that was written before Abbath took more control of the band and starting from "Damned in Black" Immortal's music became more progressive than what they had done before, with a more traditional heavy metal influence, relinquishing a lot of the formulas that were used on albums like "Battles in the North" or "Pure Holocaust". This era of Immortal for me was their most interesting, it wasn't really black metal anymore and would fall into that grey area of 'extreme metal' sitting comfortably along bands like Keep of Kalessin, despite having shed most of their black metal roots Immortal were still able to conjure up pieces of music that were dynamic, intricate, punchy and most importantly riff-driven. "Sons of Northern Darkness" epitomised this with songs such as the title track, "Tyrants" and "Far Beyond the North Waves", there were definite missteps on the album and it felt composed to appeal to a wider audience than anything they had done before, but there was an acute understanding of what elements to focus on to bring songs to life. The reason I bring up such a long history with Immortal is that "Northern Chaos Gods" seems to lack the sculpting that it appears Abbath brought to the band. Musically it sounds like Immortal, even if it does lack the distinctive croaks of their former vocalist, the song's elements that gave them mass appeal are still there yet the magic ingredient that could bring everything together seems to be missing. The songs seem to meander from track to track, there's not a track on the album that leaps out and goes for the jugular, it's not entirely aimless but at no point does it feel like a compelling piece of art. Sonically, the album feels closest to "At the Heart of Winter", which for many Immortal fans is one of their favourite albums, personally I've always found it rather pedestrian, it doesn't commit to a full black metal assault like they had done previously nor does it have the groovier and catchier aspects that were found on their later releases. I can't help but feel that if the riffs in "Northern Chaos Gods" were polished and sculpted into a more dynamic fashion with a more scientific approach to how they work with the band's other elements the overall product would have been far greater than the sum of its parts. Regarding the production of "Northern Chaos Gods", it lacks the meaty punch that was present on later era Immortal albums, their style of music has become so divorced from the initial idea of black metal that there is little need for trebly production — a crisp, modern and hi-fidelity approach suited "Sons" & "All Shall Fall", "Northern Chaos Gods" sounds thin in comparison. The major downfall of the weak production detracts from Horgh's playing; a phenomenal drummer possessing strong, pounding performances sound masked and lessened by where they sit in the mix, fills, ride cymbal work and some of the more intense blasts have been relegated to the background of the mix. Traditionally, Abbath's vocals have always been very present in the mix, something to be expected due to the unique quality of his voice, "Northern Chaos Gods" continues this trend yet they add very little to the overall experience, with Demonaz's vocals being average at best and utterly forgettable at worst. The end result is an album that will undoubtedly sate the desire for Immortal fan's taste, I would even go so far as to say that some of those fans that were turned off Immortal since "Damned in Black" may be enticed back into the fold. Ultimately I feel the album indulges nostalgia far more than build upon what's come before or attempt to create something new and intriguing. The legacy of the brand of Immortal seems to be more valuable at this point than their creative works, having continued in the face of adversity and nodding to their older works is usually a sure fire way to boost record sales with a band's legions of fans, particularly with newer fans whose enthusiasm revolves around the historical influence of a band rather than their music — it worked for Metallica, there's no reason why it won't work for Immortal.